When London presented its bid to the International Olympic Committee (IOC), it pledged ‘the first sustainable Olympic and Paralympic Games.’ The vision: ‘towards a one planet Olympics’. This was taken from One Planet Living, a global initiative developed by WWF and BioRegional – the idea of a sustainable world in which we live within the earth’s means, with an equal share of resources and sufficient space for wilderness and wildlife. Since winning the bid in 2005, the Olympic Delivery Authority (ODA) has seen both successes and disappointments on the sustainability front. In 2007, EDF and The London Organising Committee of the Olympic and Paralympic Games (LOCOG) promised a low carbon torch. While a new renewable fuel was developed, EDF and LOCOG admitted failure due to time constraints. Despite the promise being made in 2007, EDF’s own press release said “we have been working hard since 2009” – an embarrassing and public defeat. A second disappointment came in April, with the first of three London 2012 Sustainability Reports reporting a target failure to source 20 per cent of energy from renewable resources – one of the ODA’s own Climate Change objectives. On a brighter note, last month saw the ODA and Thames Water opening a “black water” sewage recycling plant. Tasked with watering lawns and flushing toilets at the 2012 Olympic Park, it is estimated that the £7m recycling plant will help save the park up to 83 Olympic-sized swimming pools of drinking water a year. Shaun McCarthy, Chair of the Commission for a Sustainable London 2012, explained that “the decision to focus the bid on East London was the key factor in driving London to offer ‘the most sustainable Games ever’.” Currently, East London is home to some of Europe’s poorest boroughs and some of the worst contaminated land in London. Reports show that the ODA is indeed exceeding certain targets. It has surpassed its goal of a 40 per cent reduction in potable water use, with the help of the new ‘black water’ recycling plant, water-efficient fittings in all venues, rainwater harvesting and filter backwash recycling. 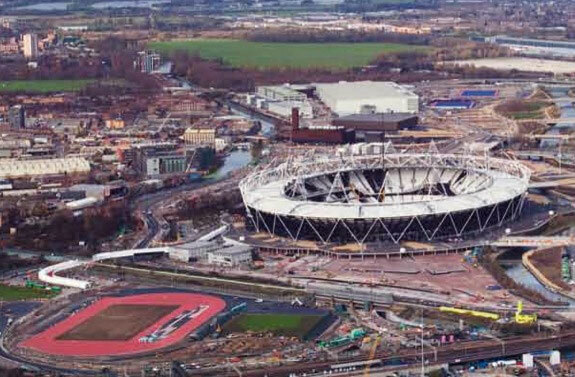 In construction, over 85,000 tonnes of embodied carbon has been saved through efficient building design and average cement substitutions of 32 per cent, 98.5 per cent of demolition waste being recycled – and eight buildings have been reused off-site, 30 new bird and bat boxes have been placed around the Olympic Park site, new trees planted – over 1,000 in East London alone – and three new habitat ponds for amphibians and other aquatic species created. Climate change – minimising greenhouse gas emissions and creating facilities capable of coping with the impacts of climate change. Waste – minimising waste at every stage of the project, while eliminating the use of landfill and encouraging the development of new waste processing infrastructure. Biodiversity – minimising the impact of the Games on wildlife in and around Games venues, and where possible enhancing habitats such as the Olympic Park. Inclusion – promoting access for all, celebrating the diversity of London and the UK, creating new employment, training and business opportunities. Healthy living – inspiring people across the country to adopt healthier and more sustainable lifestyles.